In an Oval Office announcement on Tuesday morning, President Donald Trump revealed that U.S. Ambassador to the United Nations Nikki Haley will be leaving her post at the end of 2018. Almost immediately, rumors began to swirl that Ivanka Trump could be a top choice to replace Haley. Then, Ivanka made a stunning announcement on the matter. Trump added that he is willing to welcome Haley back in any capacity within the Trump administration, although Haley said that she will be moving to the private sector after leaving her post at the UN. 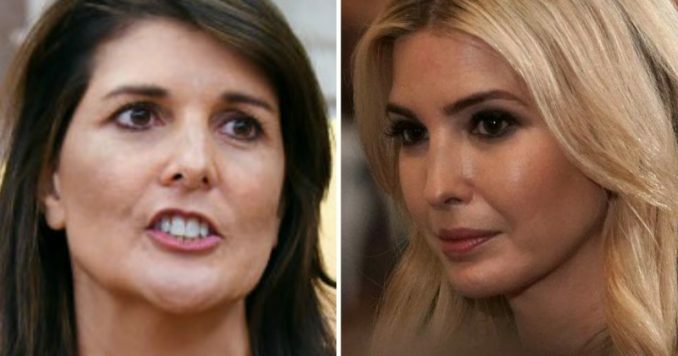 As Trump and Haley spoke together via a joint press conference regarding the ambassador’s resignation, Haley praised the efforts of Ivanka Trump as the president’s daughter looked on. “I can’t say enough good things about Jared and Ivanka [Trump],” said Haley. “Jared is such a hidden genius that no one understands,” she added, giving Kushner credit for renegotiating the North American Free Trade Agreement (NAFTA) deal last week. As the rumors continued to swirl, President Trump spoke on the matter, saying he would likely decide on Haley’s replacement within the next two or three weeks. Trump noted that Ivanka would be “wonderful” as U.S. Ambassador to the United Nations. But while he believed his daughter would be a good replacement for Haley, he said he would be accused of violating nepotism laws if Ivanka was given the job. White House officials have floated the idea of giving Haley’s job to either former deputy national security advisor Dina Powell or current U.S. Ambassador to Germany Richard Grenell. Powell worked for nearly a year in the White House with former national security advisor H.R. McMaster. Grenell previously served as a longtime U.S. spokesman at the UN during the Bush administration and has been a vocal supporter of the Trump agenda. While much is uncertain regarding Haley’s replacement at the moment, one thing is definitely for sure: Whoever steps into her position will have some mighty big shoes to fill. Who would you like to see replace Nikki Haley as U.S. Ambassador to the United Nations?